What Do You Want To Know About The New Harley-Davidson Cruisers? Last week we heard Harley-Davidson had completely revamped its core cruiser line with eight all-new Softail bikes for the 2018 model year. I’m riding almost every variant this week with some of the people who made them, so get your questions in now! Scroll through our introductory post to see what the Breakout, Fat Boy, Fat Bob, Street Bob, Lowrider, Deluxe, Heritage and Slim are all about. But the short story is, each machine shares a common rear-monoshock platform and a Milwaukee-8 big twin engine. 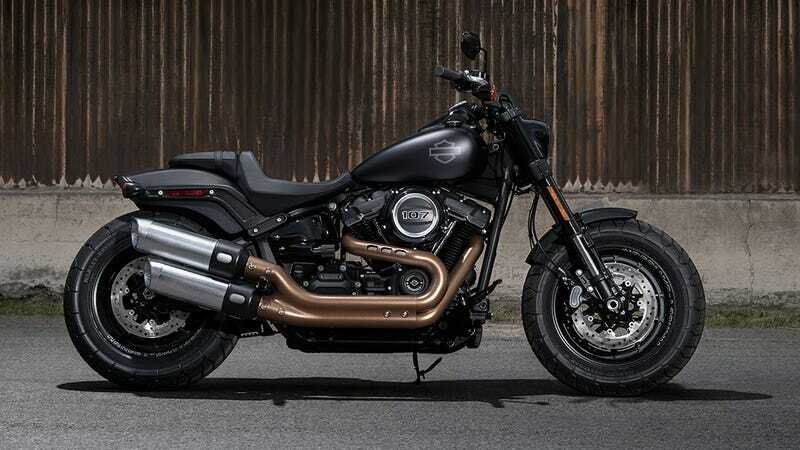 That powerplant will be a 107 cubic inch (1,753 cc) as standard equipment in all eight of Harley’s Softails, with a 114 (1,868 cc) as an upgrade option on a few. I’ll have a few write-ups and shakedowns of what these different engines and Softail variants really feel like soon. But while I take notes and have access to the people who designed and engineered these things, let me know what you want to know and I’ll try to get your question answered. Meanwhile, most of the basic specs and proportions can be found pretty easily on Harley’s website.